Here are pix from a few hours ago. Devils Walk is compressed pan of peaks behind town where I went hiking today. 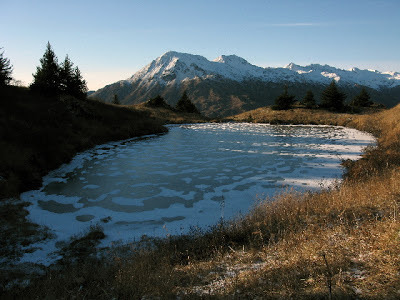 Found a pond which will be great skating but too small for wings. The rain which recently fell has exerted enough hydraulic pressure to pump warm ground water into shallow spring fed lakes and ponds. Where there was a nice three inch plus black ice sheet on Lake Lee last week I found very weak black ice floating away from the edges with open leads. The wind was pumping the ice sheet keeping the water flowing around the edges. Despite 36 to 48 hrs of temps below freezing free surface water is not ready to set up. Lake Lee needs some time and temps in the low 20s to upper teens to grow enough new ice. Forecast temps and yet another warmish blast predicted at the end of this week are not likely to allow the Lake Lee ice sheet to set up with the additional 1.5 to 2 inches of new ice recommended before anyone goes skating. Heitman is open. I dashed up hill today with hope in my heart. Went for a dream skate by the sunny shore to the tune of wind and wavelets lapping the rocks. Skiing high alpine might be a better idea for a while. 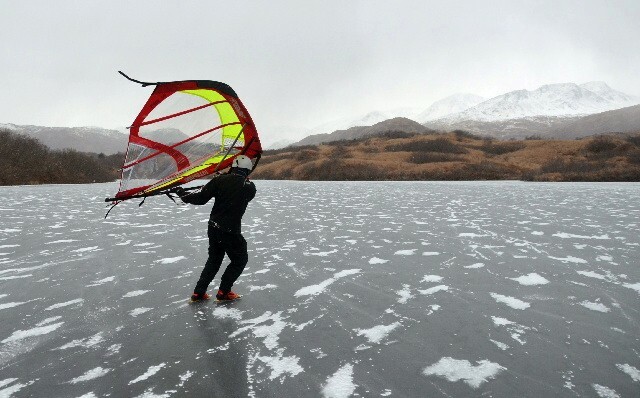 Richard Saltonstall sails his Kitewing on fresh black ice - on Halloween!! Light snow showers and solid winds make for a great session. 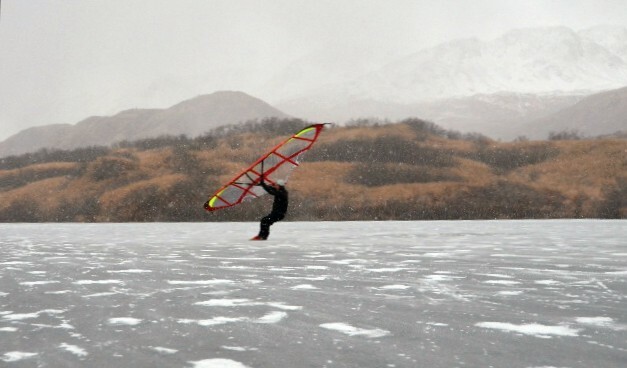 With its treeless snow covered high peaks, and ice covered ponds at different altitudes, Kodiak Island, Alaska is proving to be a fantastic venue for ice & snow sailing. I hope you all have enjoyed a great surfing summer! The summer season is almost over here in Finland and we're heading our minds towards the coming winter season and WISSA 2013 in Kalajoki. The arrangements have begun and we're in schedule. The official web pages, www.wissa2013.fi will be published in the end of September. All information regarding travelling, accommodation, racing, registration fees, rental equipment etc. will be available on our web sites from late September onwards. We are very pleased to have the honour of organizing the next Winter Worlds and wish you all warmly welcome to Kalajoki! Hanging from a 20-meter kite while it rockets you across the waves on a sun-drenched lake sounds like a pitch from a Caribbean vacation company, but in Yellowknife there is one key difference. Aside from that, it's pretty much the same high-adrenaline sport that vexes traditional windsurfers on beaches farther south. And according to Yellowknife's Stéphane Sevigny, this version is way more fun. "It's incredible, the power of the wind. You use the kite like a sailing boat. By steering your kite and your skis, snowboard, or whatever slides, you are able to go back and forth with the power of the wind. Using the power of the wind to pull you on any surface," Sevigny said. Sevigny runs Aquilon Power Kiting, and spends his time teaching many of Yellowknife's growing kiting community how to carve snowdrifts like Malibu surf. His career in kite skiing started 15 years ago in Montreal, when a friend introduced him to the sport. He's been running the company in Yellowknife for about five years, but only recently starting putting things into high gear. With the help of a Supporters of Entrepreneurs and Economic Development (SEED) grant from the territory's Department of Industry, Tourism and Investment (ITI), he was able cover the costs of getting certified as an International Kiteboarding Organization instructor, and said he's seen a strong increase in the numbers of kites on the bay. "Right now, it's kind of (peaking). Everybody's heard about it, everyone's seeing it and want to get involved. Every time I go out I see sometimes 10 new kites on the lake that I don't recognize," Sevigny said. The growth is encouraging for Sevigny, but he said it also raises some concerns about safety. That's one of the reasons he started teaching in the first place. "People need to understand the dangers involved. It can be dangerous because people don't understand the power of the wind. They think 'oh, my friend has a kite. He will teach me,'" Sevigny said. One of the most important skills kiters need to learn is how to control their kite throughout the window of the wind. The window of the wind is a three-dimensional dome extending 180 degrees downwind from a kiter. The closer to 90 degrees the kite gets, the more wind it captures. If kiters don't learn to control their kites within the power zone, they can generate so much lift that they get swept off their feet and potentially into other kiters, dragged into obstacles or tangled in lines that are tight enough to cut unprotected flesh to the bone, Sevigny said. "You need to know how to play with the kite in the power zone. 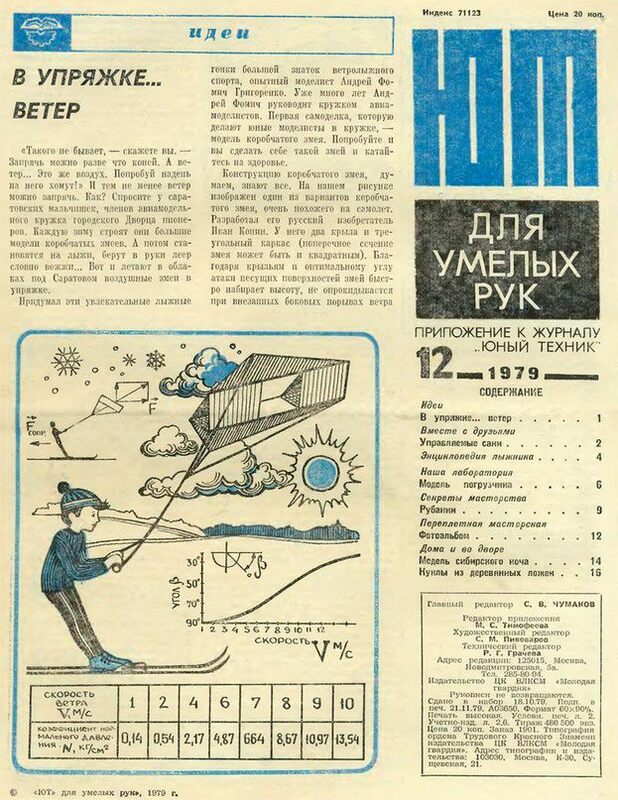 Before people go on skis or a snowboard people need to know how to play with the kite, how to disconnect it from yourself or close it down in an emergency. You wouldn't just pick up an oxygen tank and regulator and go scuba diving without taking a course. It's the same thing with kiting," he said. But once people master the skills, Yellowknife Bay is an ideal place to kite because you can catch wind from any direction. Further out past Dettah, there is enough open space that kiters can get up to 60 or 70 km per hour if they know what they're doing, Sevigny said. The kiting guru gets easily excited talking about his beloved sport, especially when discussing a future that he hopes will be bright. Sevigny is still in contact with his friends in Montreal. They have a kite racing circuit there that has seen great success, and Sevigny said he wants to replicate the event in Yellowknife for a potentially international audience. "I think the way I'm seeing it, we have a good spot for competitions. That's what I want to do soon, and you can have all different kids of competitions. You have speed competitions, acrobatics competitions. I'm in contact with people right now to create a circuit around the lake," Sevigny said. Sevigny said he wants to build an international stage race, where teams would have support crews to follow them around the different stages of a race on Great Slave Lake. "They'd stop at different parts of the circuit, and there could be all kinds of entertainment, musicians, stuff like that.. They did this in Quebec already. They had a really good competition that we could recreate here. It would be a very big event for tourism, similar to what used to the the Rock and Ice Ultra," he said. Season is Over, Season is Open! We all love ice and snow, but maybe this is taking it a bit too far? 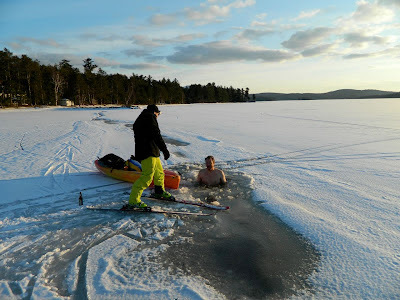 After seeing an unfortunate XC skier fall thru the ice, an idea was born. Once the skier was safe and dry, Tuthill thought that it might be smart to take advantage of the open water for a swim. "Hvad fan glor du på" remarked Tuthill as he jumped out of the freezing water. Just watch. And then wait till they build a half-pipe for themselves! 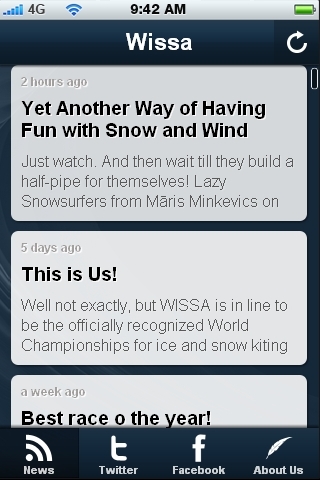 Lazy Snowsurfers from Māris Minkevics on Vimeo. The talks already underway MUST have had something to do with the reference to "Short Track"
In any case, we will see Markus in Kalajoki for WISSA 2013. Here's to the integration of WISSA and IKA! WILL KITEBOARDING BE IN THE OLYMPICS? In May 2011 ISAF Council confirmed there would be a board event at the 2016 Olympic Games. But they weren't sure what type. Both Windsurfing and Kiteboarding remained on the table. While ISAF was familiar with Windsurfing, they needed more information on how Kiteboarding could be presented. So they scheduled a series of Kiteboarding format trials in Santander, Spain from 21-25 March. "Eighteen sailors from 10 nations and 4 continents will demonstrate what kiteboarding is capable to do, " said Markus Schwendtner (GER), Executive Secretary of the International Kiteboarding Association. "An ISAF evaluation panel consisting of members of the ISAF windsurfing and kiteboarding committee, events committee and equipment committee will collect all data and present a report to the ISAF mid-year meeting (May 3-6). " The list of participants read like a who's who of the international kite racing scene: both men's world champions - Johnny Heineken for course racing and Damien Leroy for Slalom - are present as well as women's course racing world champion Steph Bridge. The European Champions Julien Kerneur and Katja Roose are there as well as the freshly crowned Asian Champion Yo Pudla Narapichit. On the evaluation panel is Bruno de Wannemaeker of the ISAF Equipment Committee, who shares additional insight into the process: "Santander is about testing the Kiteboarding formats and evaluating their suitability to fit as the Olympic 'boards' event in 2016. My understanding, from ISAF Technical Staff, is they are not concerned about selecting equipment, or 'class', as is normally the problem faced with other sailing events. "Basically there are a few possibilities: only windsurfing in the 2016 Olympics, only Kiteboarding in the 2016 Olympics, a mix of both disciplines either as team event, duathlon, national teams, relay, etc. "In an ideal world, the International Olympic Committee should grant ISAF one or more additional medal(s) for the inclusion of Kiteboarding. But IOC did not do this, and none of the current sailing events want to leave the Olympic scene, so ISAF decided that the windsurfers and kiteboarders would be trialed against each other for the board medals. "It is the stated objective of ISAF to evaluate formats for all the Olympic events, with a view to changes (improvements) that will make the Olympic Sailing Regatta more relevant in the modern era. Several formats will be tested in Santander such as course race, slalom, boarder-cross, stadium racing, short track, etc. "We assume that the ISAF Executive will make a submission to the midyear meeting in may 2012 based upon reports they receive from the Santander trials; or delay for further investigation until November. " 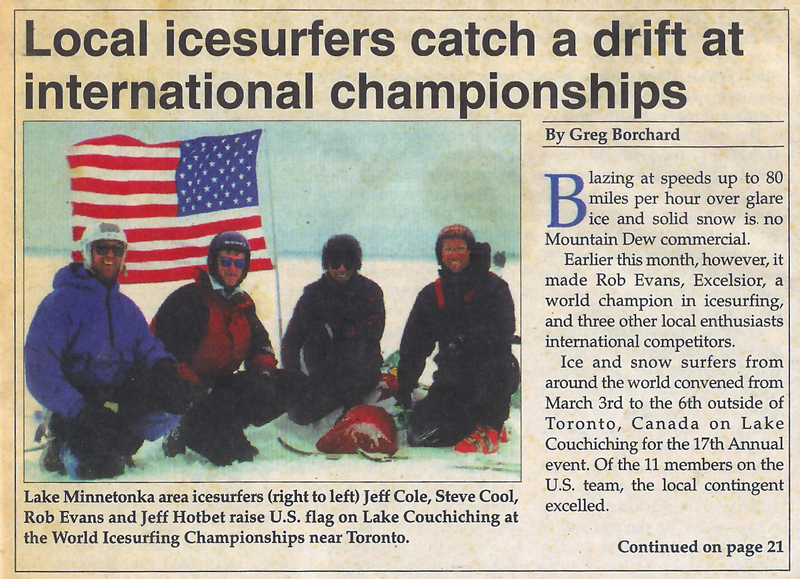 I have been promoting GPS Icesailing for many years now. This site and official GPS World Record organization uses very scientific means of gathering and reviewing GPS data to establish both World Record claims and regular rankings for participants all around the globe. Two sister sites, GPS Kitesailing and GPS Speedsurfing serve the water aspects of these sports with the fastest sailors in the world participating. There are more than 3000 members between the 3 sites, but only 150 for Land&Ice site. 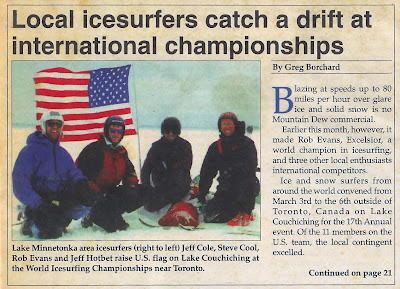 I have been primarily focused on Icesled class (windsurfer sails) and recently achieved a new World Record. But this is not my main point I wish to make here. I would like to point out that a recent post by a Kitewinger in Sweden has made a significant session post that deserves attention. Alexander Larsson has posted a 2 secong Max of 47.36 knots, which is 54.5 mph! Big time congrats to Alex! I hear he is quite good and an official Kitewing team member. This session also places him into the overall Top 10 of the year as #10! Those rankings inlcude all classes of boats, iceboards and kitewings. Here is a ranking list of all Kitewings to date. I would like to once again extend my assistance to anyone in Kitewing class who wishes to join this website and post official rankings. I have GPS loaner devices for use which I have been given to help get people more involved. Our Iceboard fleet is well represented in the USA and have dominated the class for speeds again this year. So, next season please join me with your Kitewing and join the world GPS rankings! My position in course racing slipped from 12th to 13th overall. My skis didn't seem to be running right, or maybe it was just the wind holes, but I did finish all of the races except the first one we ran on Tuesday. Mike McCaffrey took 6th, Annie Tuthill 7th, new "Team USA" rider, from Wisconsin, Gatis Makstenieks, came in 11th and Will Tuthill 10th. Mark Bussard bumped me down to 13th by taking 12th, And Viktor Hora, another U.S. rider from Wisconsin, did a good job of keeping me motivated out there and came in 14th. The total entries were 18 in the category. In slalom, I held onto my 10th place position. Mike McCaffrey slipped to 6th place and Annie bumped herself up a notch to 7th. These are overall results for the U.S. riders, a respectable showing against the formidable Swedish team and also Finland's Rainer Salo, a mild mannered soft spoken fellow who is a terror on a race course, taking 4th overall in slalom and 2nd in course racing. For more results see the WISSA 2012 webpage and go to the "Results" section where there are .pdf files for all categories. After a short awards ceremony down the road at the Kewaydin Casino (no, nobody won anything - that I know of), another World Championships came to a close. The next day I was again crossing the straight on Mighty Mac, heading south to Ohio before turning east toward home. With an overnight stop in Jamestown, New York, I was home this evening about three hours ago as I write. I will post more about the event and results, afterthoughts and ideas for future. I'll work on getting a hold of some new pictures to post and keep an ear to the wall for any new developments. I'd like to take a moment to thank all of my fellow competitors for dealing a lot of background difficulties and making a great race of it anyway. I'd also like to welcome all new group members who I met on the ice in St. Ignace. And of course, to the good people of St. Ignace and the area Native community for opening up their town and their hearts to us and allowing us to have our event. A special shout out goes to all of the volunteers who helped out a lot behind the scenes, be it judging the races or preparing our lunches or setting up all of the facilities for the races. It was a pleasure meeting with and getting to know some of you on and off the ice. So for now, good night, and keep an eye out here for more. In short-track slalom, Mike McCaffrey is in 3rd place, Annie Tuthiil in 8th, and the Captain here has broken into the top ten category for the first time at a WISSA event running in 10th place. The more races we run, the better we get. In today's action, young Ms. Tuthill got the jump on all four of her co-competitors in one race to finish second ahead of Sweden's Lars Fromell with his 9 square meter draksegl, losing only at the last mark to another of the Swedes, Peter Klingvall, arguably the fastest wing/skate sailor at the event. In the next race I started at the bottom (downwind) end of the line but was able to pull off a good start and stay ahead of the four, including Mike M. and two of the Swedes to win the heat. No one is more surprised (or insufferably pleased) then I. To give a little perspective on all this : Lars Fromell has been skatesailing since 1972. Skatesailing is to Sweden as is baseball to America. For us to compete with them at this level is something of a miracle, truth be told, and I'm pretty sure we aren't seeing their very best here. But I do believe we are beginning to lay the foundation for a truly competitive U.S. team. The Ice Spirits know I'm probably too much of a worn out old surf bum for this sort of game but there might be some younger folks out there to whom we old schoolers might pass the torch. For now I am very proud and happy with our results so far. There is no shame in being overmatched in fair and honest competition and if you can't be best you can always strive to be better. For my part, the day I stop striving will be the day I die. Tomorrow if the wind permits we will complete our course racing and maybe even run a few more slalom races because the Swedish team wants to race us some more. And I want to race them some more because every time I do I learn something. Mother Nature was unable to shut down the 2012 World Ice and Snow Sailing Association (WISSA) Championships in St. Ignace this week, but she sure made a lot of work for event organizers. With participants from nearly a dozen different countries traveling to St. Ignace for the week-long championships, the ice of Lake Michigan proved to be far too treacherous. Faced with the cancellation of an event that is only held every 17 years in the United States, the people of St. Ignace not only went to Plan B, but had to make it up on the fly — moving all activities to nearby Chain Lake. “We need this; we want this,” said Peterson of the motivation behind the hasty move. 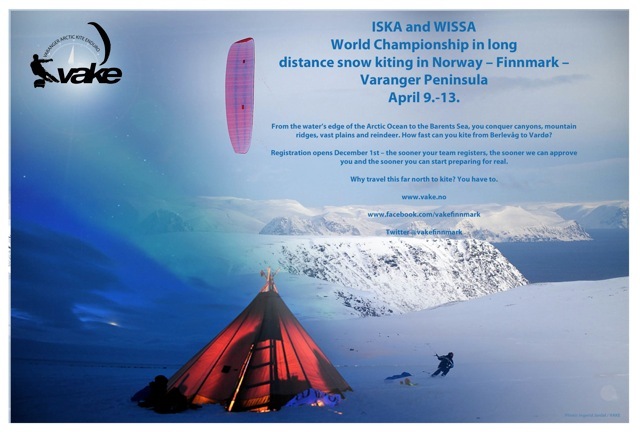 WISSA features a variety of different races with participants wearing skis or hopping on snowboards and utilizing massive kites, giant sails and hand-held wings to capture the wind for each event. While the United States and Canada were certainly represented, some participants traveled from the other side of the world — Finland, Russia and Sweden — to compete in St. Ignace. “These folks come from all around the world,” said WISSA Spokesman Dan Shires, speaking from the heated tent where the athletes warm up and eat their meals on the ice of Chain Lake. Niles Book of Marquette was one of the participants, admitting he wasn’t likely to win. Book, who usually travels to Teal Lake in Negaunee to practice his sport, said with the Seven Meter Slingshot he has hit 40 mph when conditions are right. “This is a good day for me,” said Book on Wednesday of his chance to compete against the best in the world. Peterson said the competitions will run through Saturday with the basic schedule calling for participants to begin gathering on the ice around 10:30 a.m. each day to lay out the course. “It depends on the wind (direction) and what races they’re going to run,” said Peterson in determining the set up of the course. An access road behind Little Bear East is being used for spectators looking to view the races. Shires, who also is involved with the North American Ice and Snow Sailing events, said St. Ignace will play host to one of its events next winter between the third and fourth weeks in February. This morning brought a trace of new snow and stronger wind than yesterday. Wings and sleds ran 3 course races successfully before breaking for lunch.The new snow was on the sticky side and the wind never really filled in and since these conditions favor lighter riders I was once again fast among slow. By expending serious amounts of sweat equity (and the occasional colorful metaphor) I was actually able to complete all three races and several riders DNF'd. Course racing is like that. You don't have to be the fastest but if you're faster than someone else you move up in the standings. Even a DNF (did not finish) is better than a DNS (did not start) so it even pays to show up. It was a workout and once again I was soaked. After lunch I changed my two inner layers of clothes and switched back to skates for some short-track slalom racing. Here at last is an arena in which I can actually give the others a race. Everyone but the Swedish team, of course...they sail on their tall blades with a precise smoothness that is awe inspiring to witness. One of them doesn't sail a wing at all but a draksegl, or dragon sail, a type of skate sail. It's roughly trapezoidal in shape and supported by aluminum spars. This particular one is 9 square meters in area. Unlike a wing, the rider holds it on his upwind side and leans into it. Not an easy thing to sail at all, let alone race competitively. For my part, I actually won several heats by capitalizing on other rider's mistakes or by simply grabbing the gusts with the 4.8 and outsailing them. Then I would be moved to the next higher bracket and take the starting position at the downwind end of the line and come in last because the others would block my wind.By that time I was having way too much fun to care. We ran 9 races all told in this format. Short-track is the BOMB. I will post more about this in times to come as I learn more about it. By the way, guess who got his picture on the front page of the St. Ignace news today? I didn't post yesterday as planned - after the skipper's meeting it took some time to get our gear to the lake and set up. 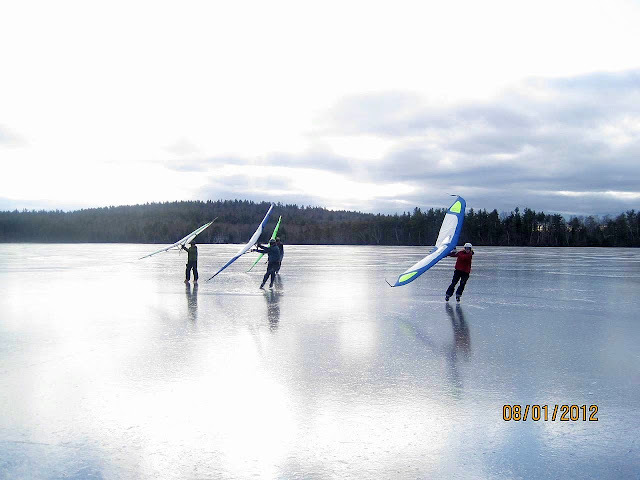 Then we spent the early afternoon sailing on the cleared ice practicing for the short track slalom before heading out onto the main lake with skis for course racing. The kites has been out racing while we were practicing. By the time we got out there the wind had become spotty so it turned into a skate-a-thon and with my heavy DH boards on I quickly became fatigued. The course was an up/down format and we were to complete three laps. By sheer force of will I was able ro round the windward mark twice but I was running last and after the second rounding I saw the marks being pulled so I knew I had DNF'ed. Turns out I wasn't the only one... several sailors had already called it quits. Light wind and soft snow made for slow going and after the race I had to ski-skate about a half mile back to the pits. I was exhausted, dehydrated, and soaked to the bone with perspiration, as a result of which I also became chilled as the sun set. On returning to my ro, I simply had no energy left so I went to sleep. That's why I didn't post yesterday. Today we had light wind again so we did more practice races on the short track area, giving those of us unfamiliar with this format more time to learn it. The kites completed more races out on the main lake but due to lack of sufficient wind wings and sailboards had no official races. They say there will be wind tomorrow so game on. Much more to tell, of course but there's a beer somewhere calling my name. My perhaps dangerously overladen Forester performed magnificently on the long drive here, 20 hours all told with the planned overnight stop in Cleveland. Morning found us back on the highway and we gobbled up the miles, did the RuShip and I, the way a hungry Pac-Man chomps down the ghosts. The highlight of the trip was crossing the Mackinac Strait on the six-mile long bridge. Mighty Mac, they call it, and combined with the view toward Lakes Huron and Michigan it was simply the most awe-inspiring sight I have seen in many long years. Upon completing the crossing, you find yourself in St.Ignace where the local folk are pulling out all the stops to welcome us here. During the opening ceremony at St.Ignace Middle School, we were treated to performances of Ojibway drumming and dancing by members of the area's Native community. The performances were im part to welcome us, and in part to "honor in loving memory, a quiet hero", Senior Chief Petty Officer Special Warfare Operator (SEAL) Heath M. Robinson who gave his life in Afghanistan in service to this nation. Are not all true heroes thus? A moment of silence, if you will, and perhaps prayers for his family. We were invited to join in the Friendship Dance, to dance in a full circle around the drum they called the Grandfather, because all grandfathers enjoy seeing their children and grandchildren around them dance and be happy. Another of the Ojibway performed a hoop dance with such agile footwork I wish to see him on skates with a wing. Then he would intertwine the hoops along his arms and spread them as though they were eagle's wings. Which was exactly his intention as another of his nation who was sitting near me said. When I told him I had seen eagles on my trip here, he said it was a sign of a good day. And so it has been. Dinner after the ceremony was hearty and filling, and we spent a little time afterward looking at all the young children's drawings about WISSA with their impressions of ice and snow sailing. Regrettably, ice here has been as fickle as back home. We can neither sail on Moran Bay, just across the street from where most of us are staying at the Driftwood Motel, nor on the strait beside Mighty Mac, but on a small inland lake close by. Chain Lake has plenty of ice and we will make it work. The Show Will Go On. Skipper's meeting tomorrow at 9:30, and then off to the race. I will try to post again tomorrow, maybe around mid-day. Put on skis, skates or a snowboard. Launch a kite. 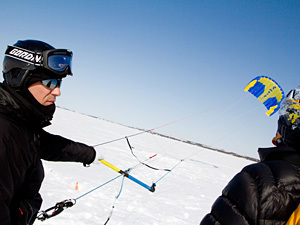 And start tacking up wind on Rice Lake during the fifth annual Snowkite weekend at Elmhirst Resort on Jan. 27 to 29. "It's an up-and-coming sport," said Steve Elmhirst, with Elmhirst Resort near Keene, who organizes the annual event. 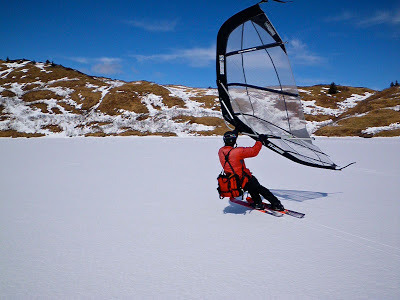 The kites used for snow kiting are similar to paragliding chutes. They're not childhood-type kites. They're massive kites that range in size from about 1.5 square metres up to 16 square metres and beyond. A person attached to a kite uses four lines to steer the kite, travelling perpendicular to the wind — similar to sailing. Beginner lessons on trainer kites will be available for a $10 fee. The $10 fee includes access to the poker run with its prizes and access to the resort's recreation facilities, including the indoor pool, hot tub, sauna, weight room, skiing and skating. People can learn how to fly a kite, Elmhirst said. "That's what kite weekend is all about," he said. The flight lesson is done with a kite that's about 1.5 square metres in size, Elmhirst said. If participants feel comfortable with kiting after the lesson, they can try kiting while wearing skis or skates, he said, adding the use of skis and skates is included in the $10 fee. 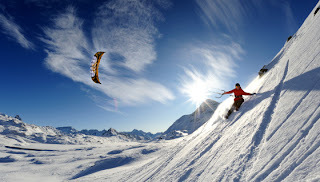 Snow kiting can be done at a leisurely, relaxed pace or it can be an extreme-type sport with skiers and snowboarders doing jumps and flips as they're pulled along by the kite. Unlike downhill skiing and snowboarding, there's no need for an expensive lift pass, Elmhirst said. "When you have a kite, all you have to do is launch a kite," he said. "It's excellent exercise. It's colourful. It's environmentally friendly." Elmhirst encouraged people to show up to watch the snow kiting even if they don't want to take a beginner's lesson. "It's a great excuse for people to get out and walk around on a nice winter weekend," he said. The event starts with snow kiting and watching video of snow kiting on Jan. 27. There will be swap table for equipment, a poker run, kite demos and lessons on Jan. 28 and 29. NOTES: Elmhirst Resort is at 1045 Settlers Line in Keene, about 30 minutes southeast of Peterborough on the north shore of Rice Lake…. The resort's website is www.elmhirst.com.